Flat Apex trigger for the S&W M&P next to the factory original, right. How a pistol fits the hand is just as important as a rifle or shotgun stock fits the shoulder. Trigger length and grip fit are the same for pistol shooters. I think one of the best things I can do for a client is set them up with the right trigger. If you ever wore the wrong-sized shoes or had the car seat in the wrong position this will make sense. To be a more accurate shooter you need to have a properly fit trigger to match the length of your finger. Most pistol shooters overlook this and think of the trigger more for cosmetics like color or shape. For accurate shooting the trigger finger must move to the rear in line with the bore. A short finger reaching for the trigger will tend to push the trigger to one side as the finger moves in an arc instead of straight back. Ditto for a long finger with a short trigger. This shows up on the range as left or right groups, provided you have good trigger control. You don’t need to be a bullseye shooter to want accuracy. I work with many police agencies which are now putting a lot of emphasis on hitting the center of the target. Milling a Greider trigger to fit in a Colt 1911 using a four flute 3/8" end mill. It can be done with a file and Dykem marking fluid too. Ohio gunsmith Dave Laubert has seen an uptick in the number of law enforcement clients choosing the flat trigger. “The flat trigger gives officers faster finger placement allowing them to concentrate more on the draw,” said Dave of Defensive Creations. He also says many are shifting to the same flat trigger on patrol rifles. Manufacturers offer a wide variety of trigger lengths and shapes today which the gunsmith or the DIY-capable gun owner can install. Some manufacturers provide interchangeable back straps like the S&W M&P series or the new generation of GLOCK pistols. These allow the hand to move closer or further away from the trigger for proper fit. I like to fit 1911 triggers with the client if I can by test fitting the pistol with the chosen grips to see where the finger lays on the trigger blade. The trigger should lie comfortably on the middle of the first pad of the index finger. Fitting a new trigger for a 1911 can be done with hand tools like a flat file. To do this, remove just enough material to allow the trigger to fit in the frame with no vertical slop and no drag on the trigger bow. Lay-out fluid will show any high points. Place the new trigger in a small vice, clamping lightly on the blade not the bow. Now file a few strokes across the top and bottom, then test fit. Aluminum cuts fast so go slowly. I reverse the trigger in the vice each time to avoid cutting at an angle. At left, a long trigger by Greider Precision, right, a medium length trigger. Only the long trigger has weight reduction holes. Iuse the mill to fit the trigger, using the bow as a guide in the vice and to make parallel cuts I clamp the blade gently in the smooth-jawed vise. A high-speed steel cutter in 3/8" works well, allowing a full cut in one pass. Once cut, I use a small India stone to deburr the edges. A properly fit trigger should glide in the trigger track. 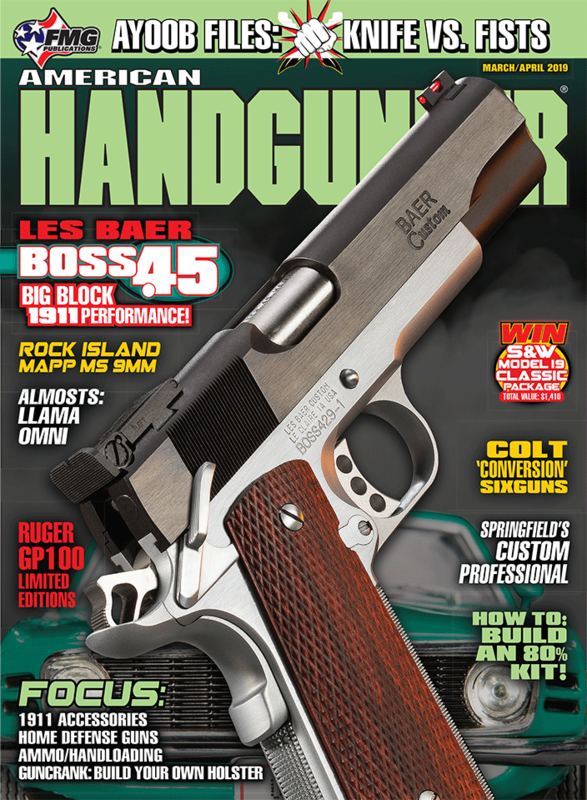 Greider Precision, Harrison Design and EGW all offer an oversized trigger in three lengths for the 1911. EGW even offers a “blank” that can be sculpted as you like. Some triggers are made of carbon fiber or injected polymers but aluminum seems to be the most popular, and machines the best. For models like the S&W M&P, SIG SAUER and Springfield XD line Apex Tactical, GrayGuns and Powder River Precision offer trigger kits of various shapes and sizes, installed with hand tools. Most also offer video instructions to follow. And a note of thanks to my friend and predecessor Ted Yost, who inspires almost every pistolsmith with his words and talent. Ted has been a leading pistolsmith and innovator for years. His shoes are very big, I hope I’m able to fill them — at least half full. Thanks, Ted!